The CAN! Sunset Boulevard Reforestation Program is a collaboration between Climate Action Now!, SF Public Works and the Office of SF District 4 Supervisor Katy Tang. 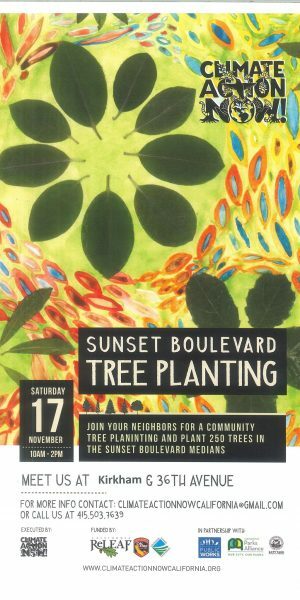 The next work party will be held on Saturday, January 26, 2019 10 a.m. to 3 p.m.
Join your neighbors and fellow volunteers to physically plant out hundreds of trees in the Sunset Boulevard Medians. Trees from California will be prioritized with examples of other diverse trees from around the world. disadvantaged communities as defined by CalEnviroScreen 2.0.
engagement in the physical planting and ongoing volunteer-led establishment of the new trees. Students from George Washington High School will receive stipends to learn about urban forestry, climate change and biodiversity, while participating in a dynamic internship funded by the California ReLEAF Social Equity Grant Program as well as funding from the SF Public Utilities Commission project learning partnership grant. maintenance to urban forestry, bee keeping, organic agriculture and soil building. YOU! And those trees come in 3 sizes: Emergent Layer, Canopy and Understory. forest, CAN! is recruiting supporters to invest in the project. Buy a tree for the Sunset Medians in honor of a loved one. 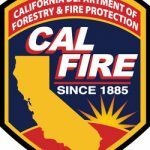 the State CAL FIRE resources. Buy a tree in honor of your children’s graduation, or in honor of a loved one. invested in supporting this invaluable community resource. *(minus the costs of the trees/stakes and tree bags). 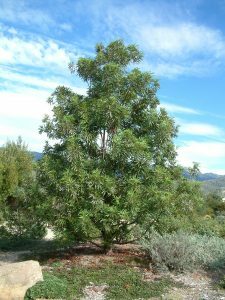 Additionally, many trees have been selected from the southern hemisphere (Australia, New Zealand) due to their drought-tolerant nature. These climate- adapted species have been approved by the State and Municipal Governments to ensure that the tree canopy will be robust, diverse and vital, even in the face of California’s changing climate. Building a sidewalk garden may be more affordable than you think. And frequently government supported programs provide the bulk of the investment. In general, pavement removal costs per square foot decrease as the garden area increases. Email CAN! to get a quote to build your sidewalk garden today. Climate Action Now! (CAN!) cultivates educational and ecological resilience by teaching Californians about climate change while removing pavement to create organic gardens.